The beach at Playacar Palace Resort in Playa del Carmen, Mexico. I can predict with 100 percent accuracy that the first day back at work after vacation I will be a big bowl of grumpy. 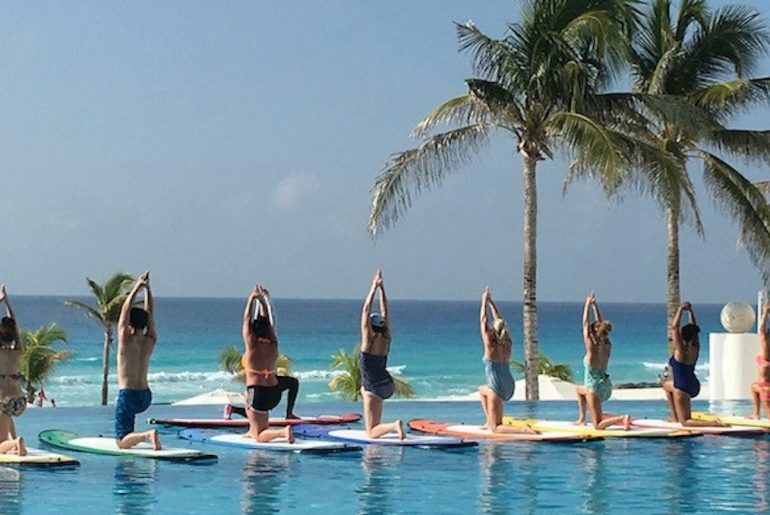 Returning from a fun trip is always hard, and made so much more difficult if you encountered sticker shock from all the Amex charges you racked up, plus several layers of taxes on your hotel bill. 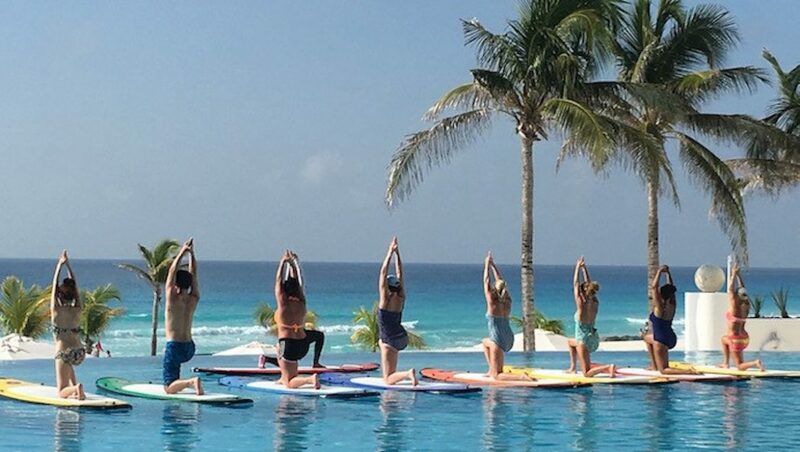 That’s just one reason I love all-inclusive resorts. Danger, danger! 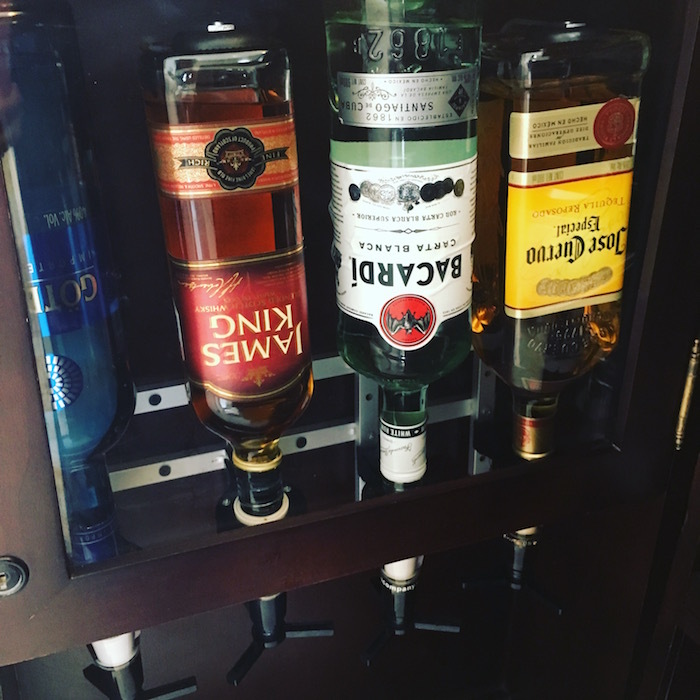 That was my thought when the bellman showed me the in-room drink dispenser at Playacar. These are in every room, but I steered clear. Best Tuesday afternoon ever: fresh ceviche, a glass of Sauvignon Blanc, a comfortable lounge chair and this view. 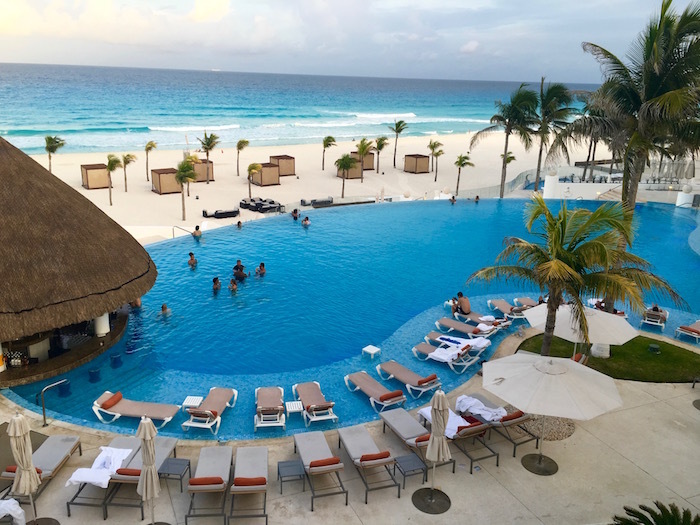 On a recent trip to Cancun, I visited three gorgeous all-inclusive properties, all part of the Palace Resorts. 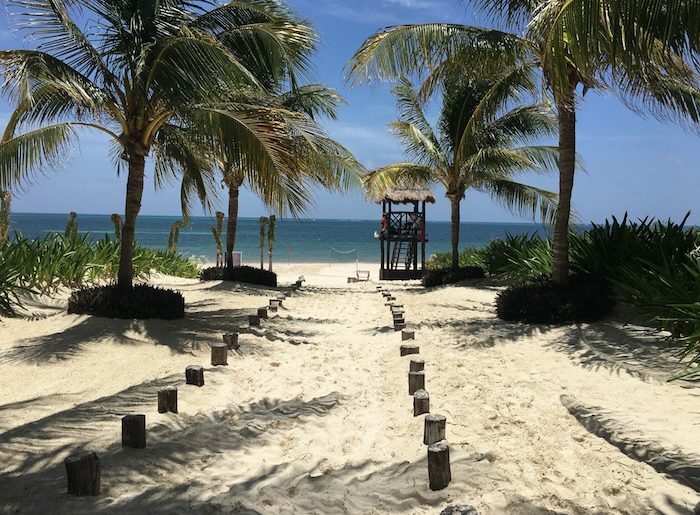 This hotel group has eight properties, with four in Cancun and one each in Jamaica, Cozumel, Isla Mujeres and Playa del Carmen. 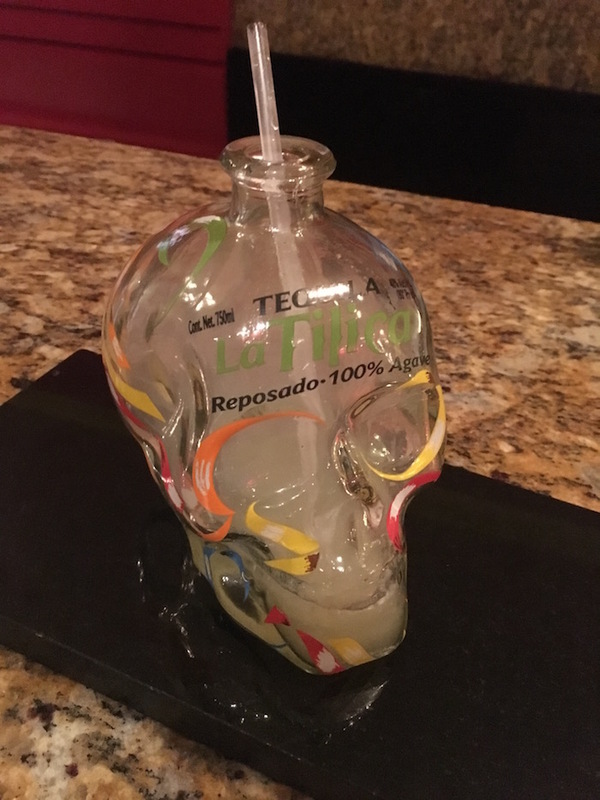 A first for me at Playacar: drinking out of a skull, a smoking drink no less, made with mescal and named De La Muerte. 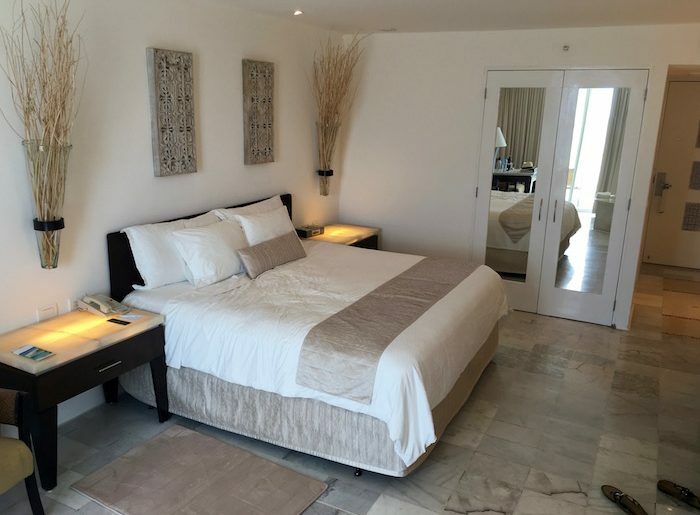 They all offer a friendly flower/drink welcome at check-in, free wifi, 24-hour room service, gorgeous beachfront locations, nightly entertainment and luxurious accommodations. 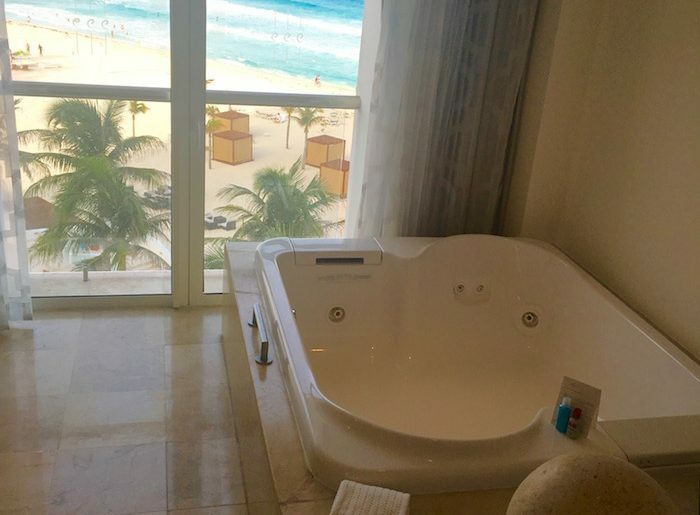 They have two features I’d never seen before — a huge whirlpool tub for two (right in your room! 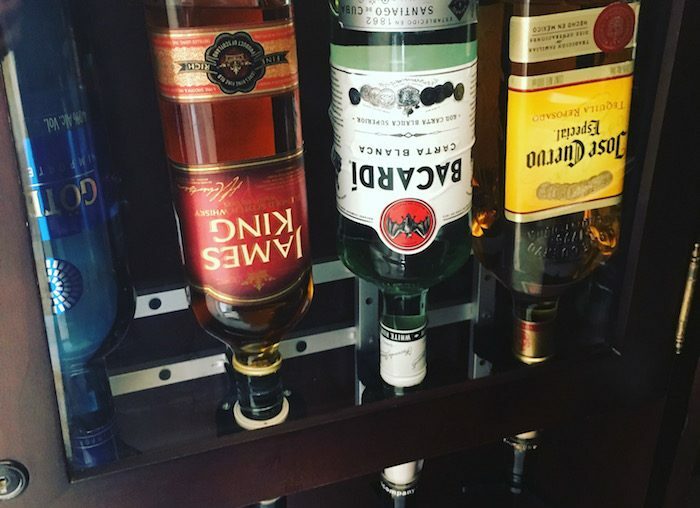 ), a CHI hair iron and an in-room liquor dispenser. I used two out of three, and kept my distance from the other. And let’s not forget the amenity that really fills me with joy — the swim-up bar. So how do you choose? My room at Playacar, with another light-up nightstands. The best way is to pick on the basis of who you are traveling with. But here’s an important note: whichever resort you are staying at, you have access to the others, with the exception of Le Bianc. A 24-hour shuttle service runs between the properties while a ferry can take you from Playacar Palace to Cozumel Palace. And if you book a five-to-eight night stay, you’ll receive $1,500 resort credit to use for visits to the spa, golf, romantic dinners and tours. 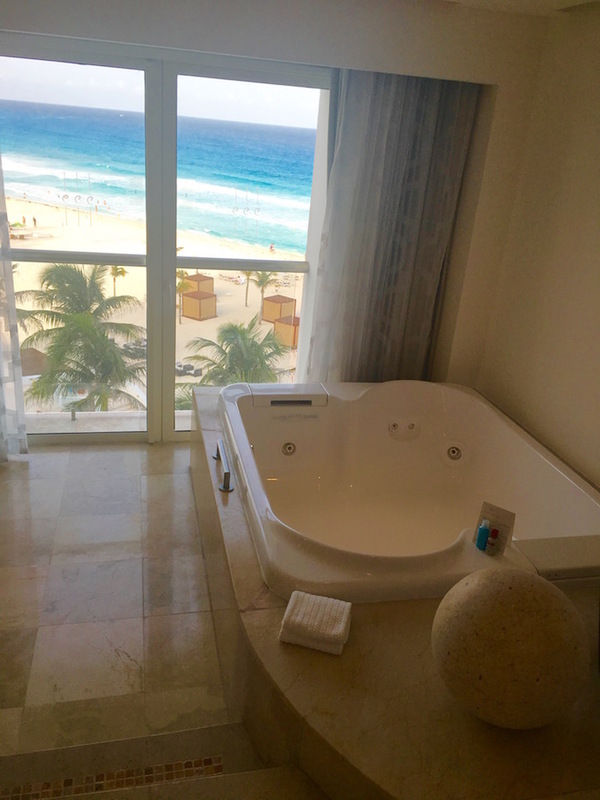 I spent my first night at Playacar Palace, about a 45-minute drive from the Cancun airport in Playa del Carmen. The first thing I do upon entering a hotel room is fling open the curtains. My view from the balcony of my beachside room revealed a huge beautiful beach dotted with lounges and umbrellas, people frolicking in the pool and a slew of bartenders happily serving frosty cold drinks. I couldn’t get down there fast enough. One of the many pools at Moon Palace. Whether you want to play, relax or do laps, there’s a pool for you. 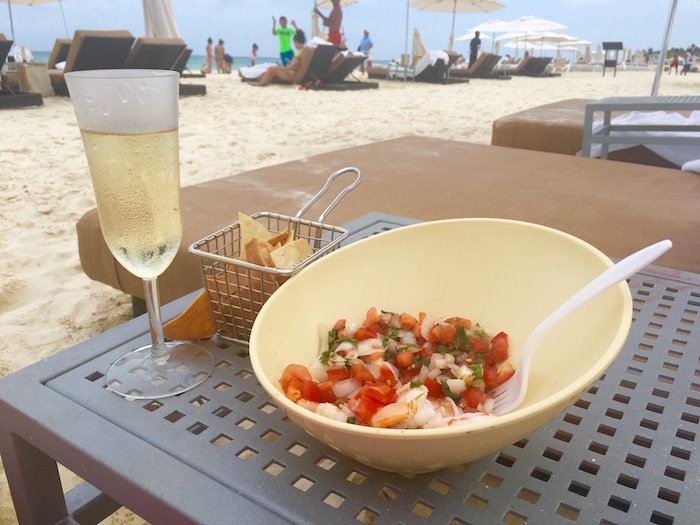 I made my way past the happy vacationers, plopped myself into one of the many available lounge chairs on the beach, and indulged in a dish of fresh ceviche and cool glass of Sauvignon Blanc, brought by the accommodating waitstaff. Nothing makes me happier than eating and drinking outside, an experience on steroids when you have a view of the Caribbean, your toes in the sand and a server awaiting your next desire. 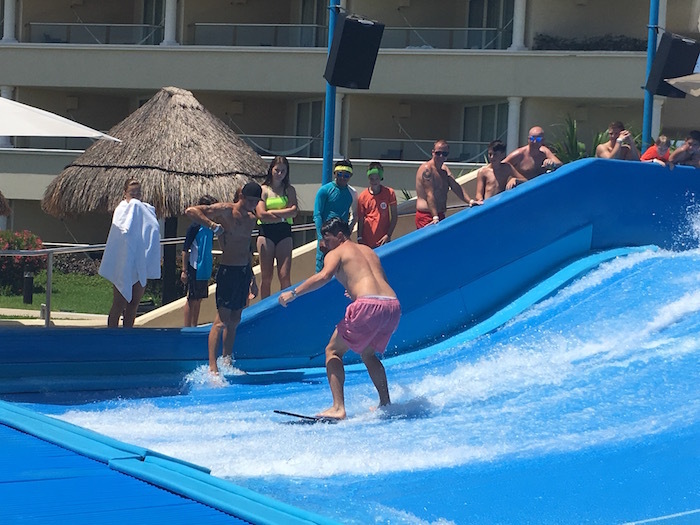 The FlowRider is popular at Moon Palace, and complimentary to guests. Hang onto your suit. 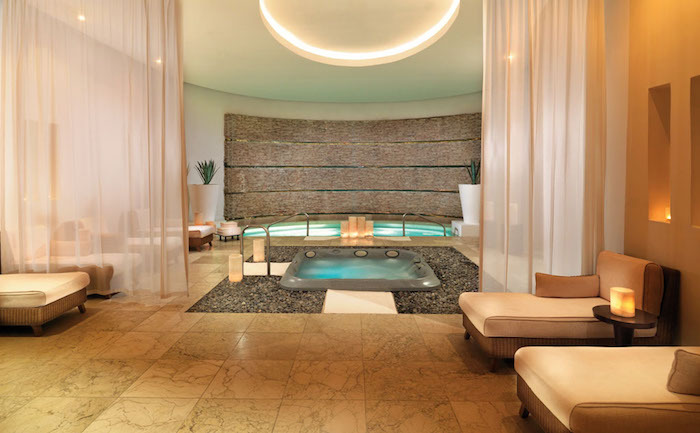 There’s a spa, golf course, and when you can drag yourself away from the resort, world-class shopping just a short walk away on 5th Avenue, a long pedestrian-only outdoor shopping mall with everything from cheap sombreros to fish pedicures and Louis Vuitton handbags. We took a stroll after dinner, watching street performers, window shopping and relaxing with a gin drink on the second floor bar at Frida Kahlo Restaurante. 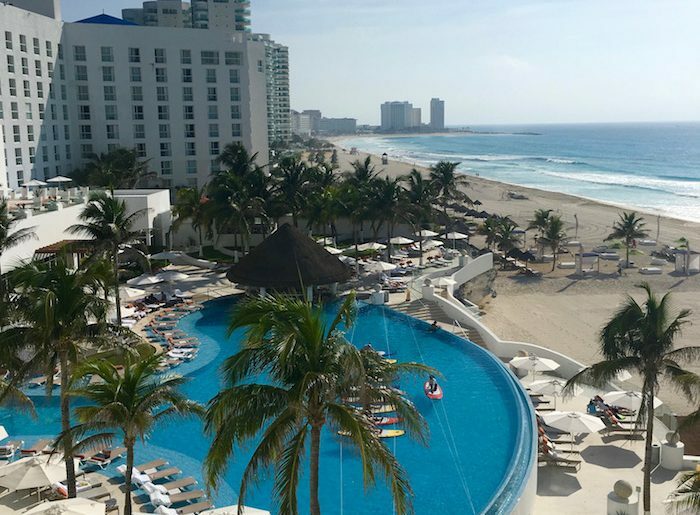 Playacar Palace: 201 rooms, 3 restaurants, 4 bars. $348 per person per night, double occupancy. Includes all taxes and gratuities. 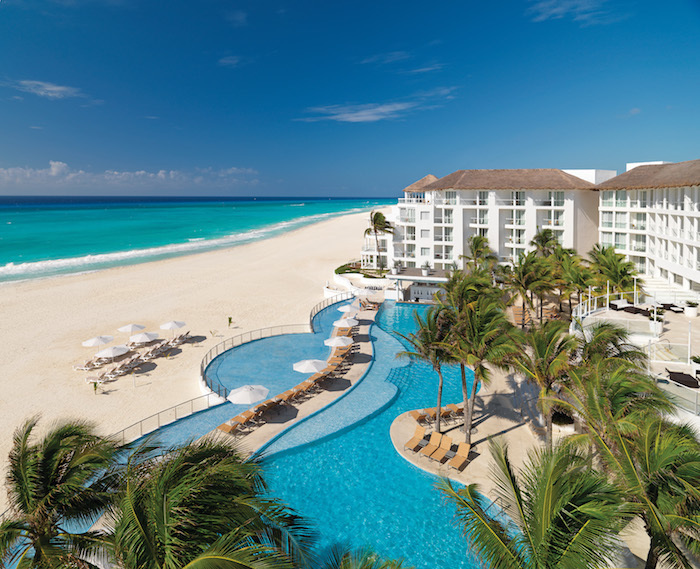 45 minutes from Cancun International Airport. 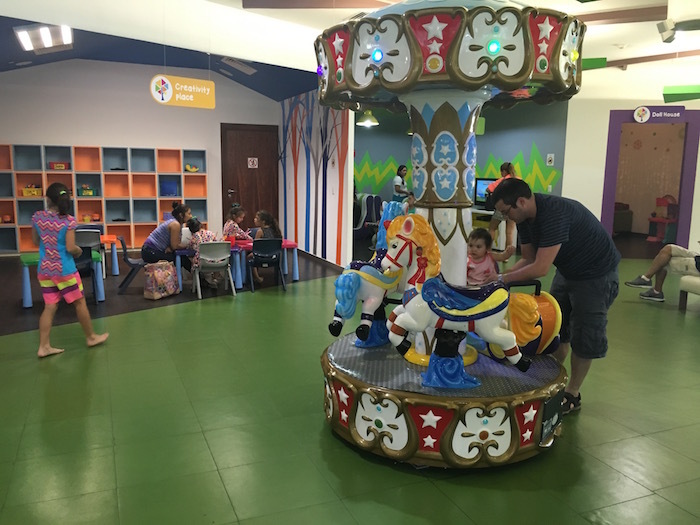 The complimentary Playroom at Moon Palace has activities for kids 4-12. Younger kids can play there, but must be accompanied by an adult. Once you enter the massive grounds of Moon Palace, there’s no reason to leave. Ever. It’s really like three resorts in one, with three huge lobbies. 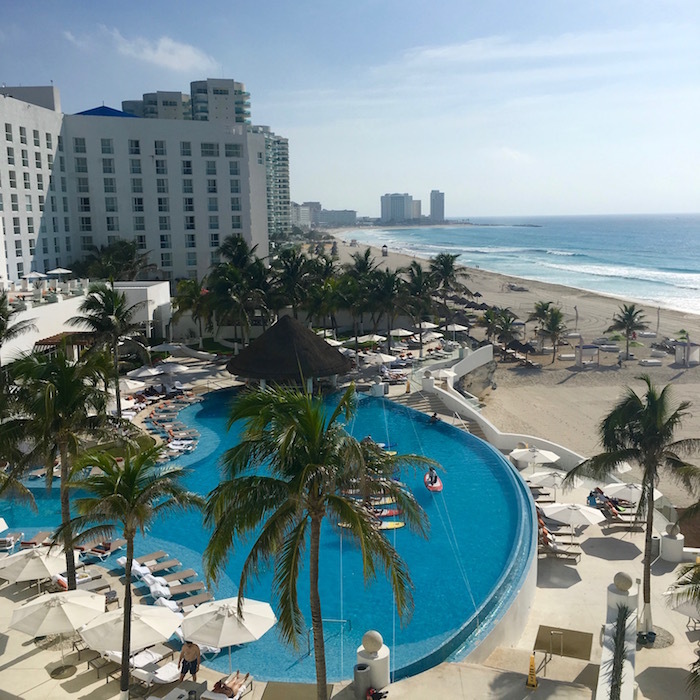 With 1,316 rooms, and 900 more opening early next year, Moon Palace will soon be the largest resort in Latin America. 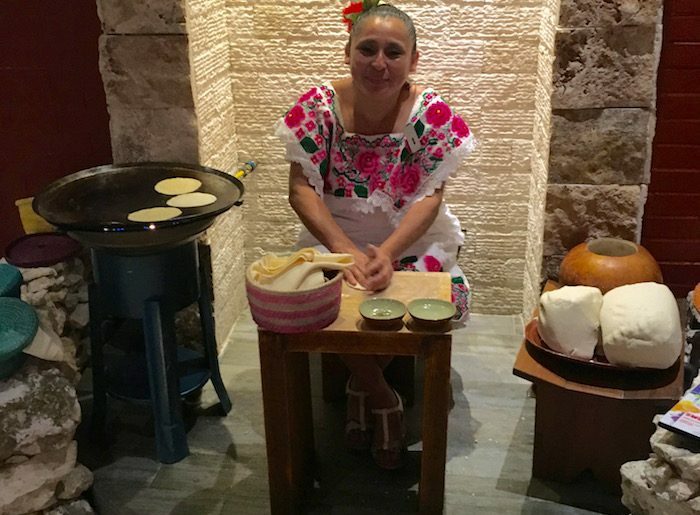 Our dinner at Riviera Maya at Moon Palace included fresh tortillas cooked right in the room. With a huge property comes a large selection of amenities. There are seven outdoor pools, five swim-up bars, nightly shows, a 950-room theater, nightclub and “The Playroom,” a state-of-the art kids play area with several play areas for just about any activity, including an arcade zone, theater, two playgrounds, Xbox room, beauty and fashion room complete with a runway and costumes and its own restaurant where kids can eat breakfast, lunch and dinner. 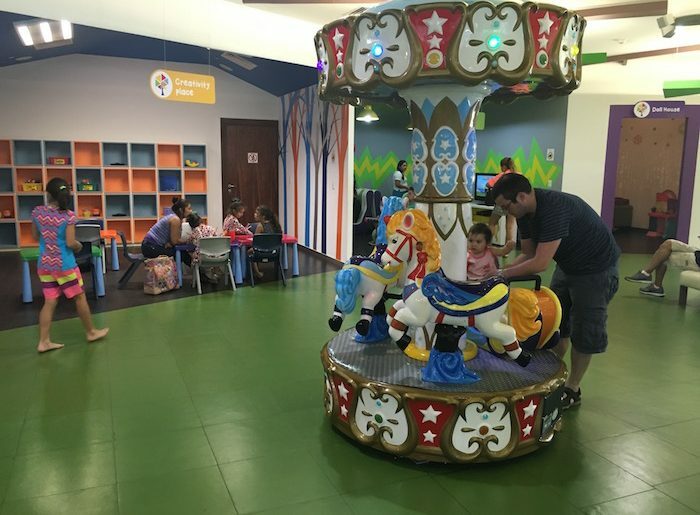 And it’s all complimentary for kids ages 4-12. 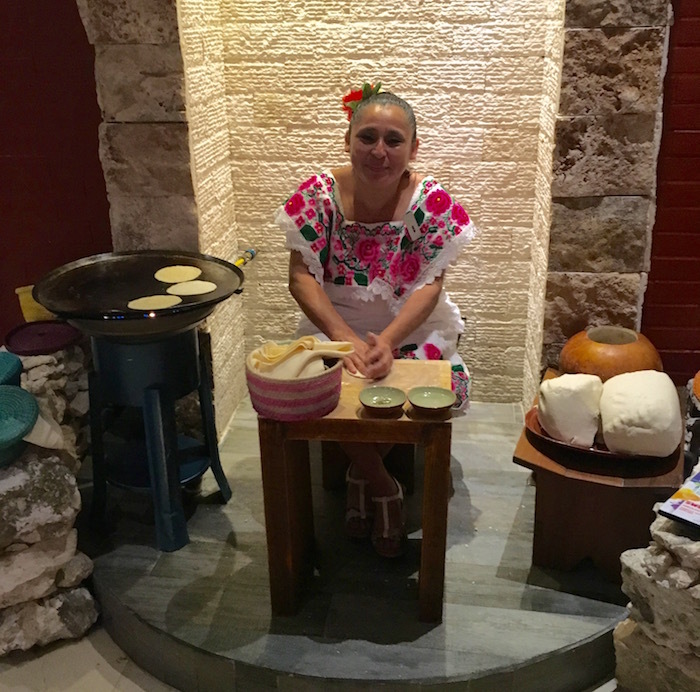 Activities include piñata making classes, balloon sculpture classes, a Jenga tournament and chef’s hour. 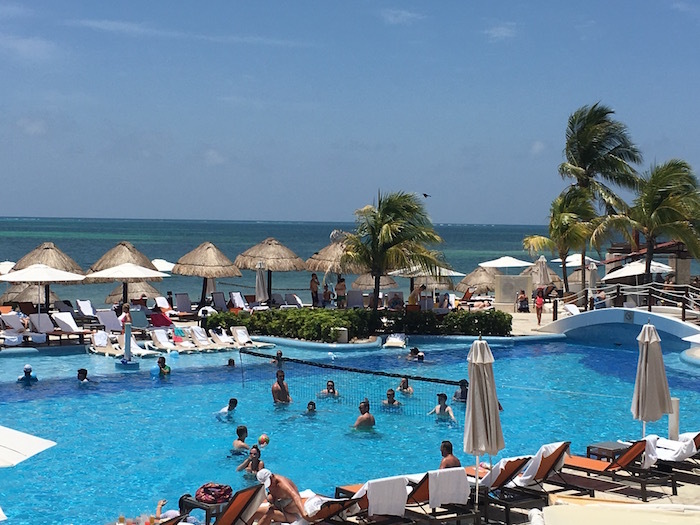 We enjoyed a delicious Mexican dinner one night at Riviera Maya and opted for a leisurely lunch poolside one afternoon to linger in our swimsuits a bit longer. Burgers and fries are best eaten under an umbrella with an inviting pool just steps away. While the poolside FlowRider, an artificial wave-making machine, is available free of charge, I opted to sit that one out after witnessing several wardrobe malfunctions. The view from my balcony at Le Blanc. Seriously. It was only the anticipation of a spa treatment that got me out of that glorious sunshine. Not that I had a whole lot of stress left after eating, drinking and lying around under the cool shade of an umbrella all afternoon where my only activity had been lifting my glass to my lips and cooling down in the pool. View of Le Blanc beach. Note the swim-up bar on the left, my first stop upon arrival. If you’re looking for quiet, elegance and romance, pick the Le Blanc Spa Resort. 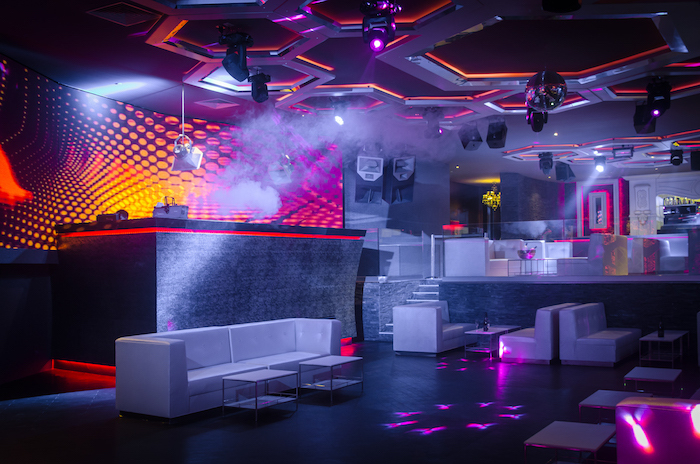 From the moment you step into the lobby, the elegant design and attention to detail is evident. No children are allowed here, but you will have a butler attending to your every need should you desire. 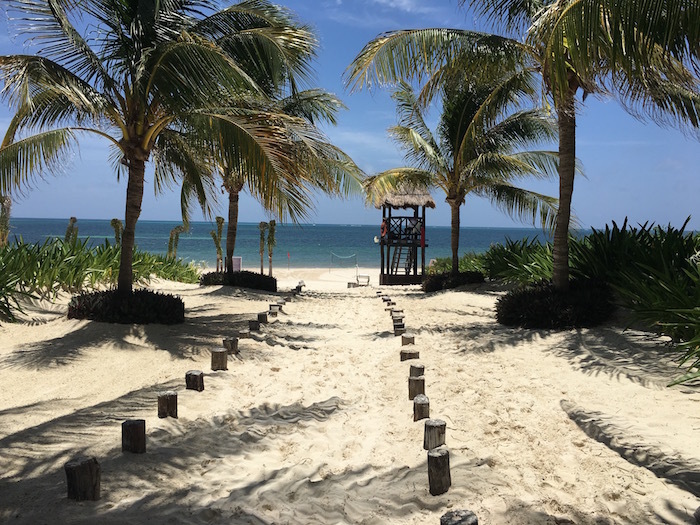 I was welcomed with a cool glass of a refreshing coconut concoction and had a warm scented neck wrap placed around my shoulders while I completed the check-in process. 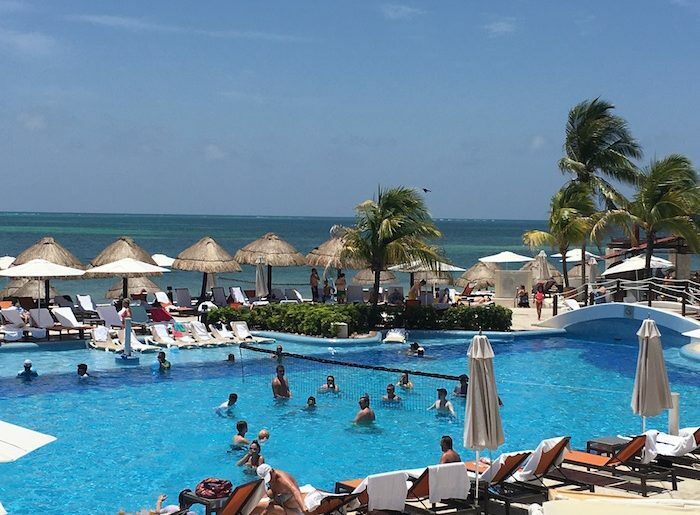 After snapping several photos of the spectacular view from my room, I quickly threw on a bathing suit and headed to the swim-up bar. With a frosty ginger mojito in one hand, I made my way to the edge of the infinity pool and took in the views of the Caribbean Sea while toasting my good fortune. So the photo isn’t the greatest. Have you every tried to photograph a backlit tub? But it shows the double tub in my room with that magnificent view. My bed, like the others, was so comfortable it was like slipping into a hug. The breakfast buffet had just about everything I could imagine, including my favorite Eggs Benedict. I sipped my morning coffee while enjoying that magnificent view from my oceanfront seat. Our farewell dinner was a lively one at Lumiere, where we dined on French fusion food and ended the evening with a limoncello toast. 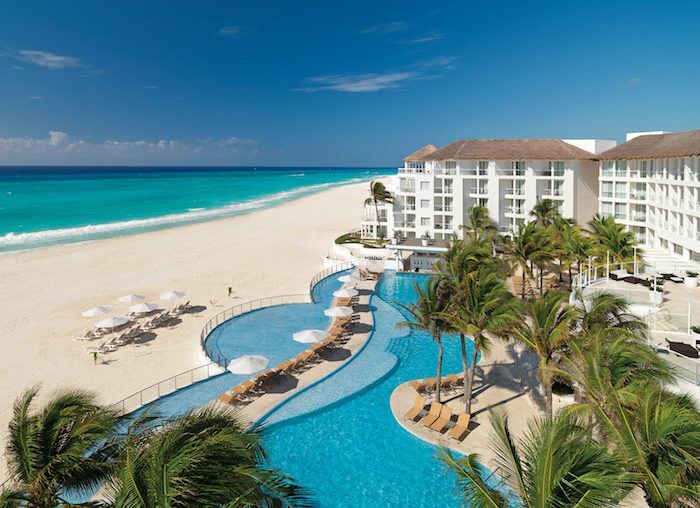 Le Blanc Spa Resort: 260 rooms, 5 restaurants, 5 bar. $463 per person per night, double occupancy. Includes all taxes and gratuity. 25 minutes from Cancun International Airport. Check dates and availability at Booking.com.